I must like trolls. 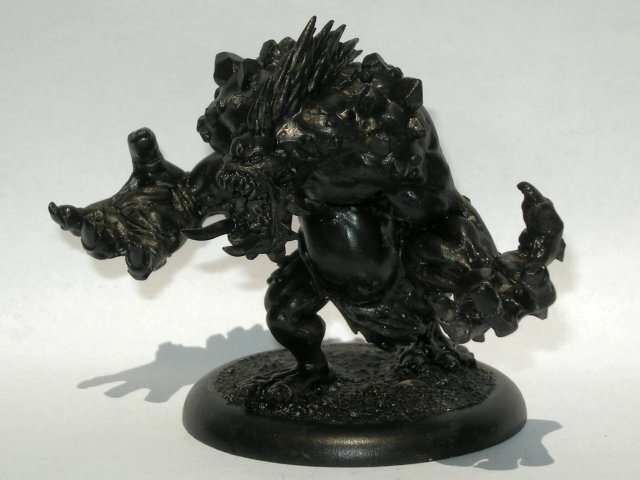 This is the model that first drew me to the Hordes game from Privateer Press. 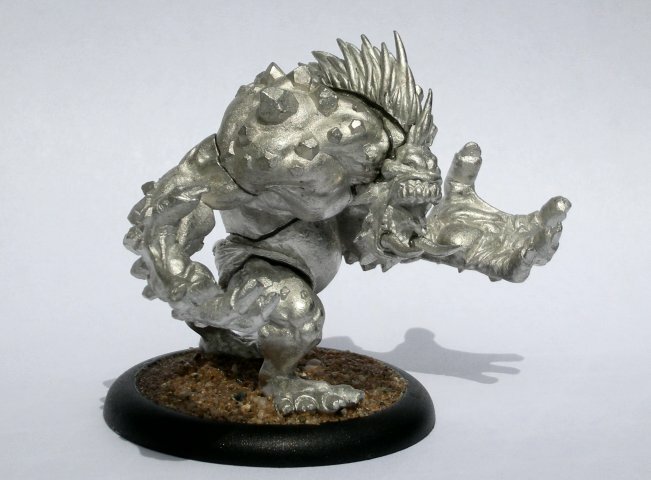 The Dire Troll Mauler is a mighty warbeast fighting for the Trollbloods faction, and the model looks like it will make a formidable opponent on tabletop battlefields. Assembling this model was a challenge. Its many pieces fit together rather poorly, and I didn’t have the patience to correct that problem with file work. Instead, I applied liberal amounts of two-part epoxy and other adhesives. For extra strength, I also pinned many of the various parts together with a combination of metal rods and a bamboo toothpick. I secured everything with tiny rubber bands while the epoxy slowly cured in my warm garage. The tusks posed an especially difficult problem. After thinking about it for a while, I rigged a contraption to hold them in place while the epoxy set. This consisted of a pocket tool with one blade extended upward to support two small clamps, which allowed me to adjust the height as needed. The whole assembly process took about two weeks, most of which were spent waiting for the epoxy to cure. During this period, I also glued sand to the model’s base for texture. Since my uninspiring assembly job left a number of obvious gaps between the model’s components, I next set about concealing these flaws. I mixed up an unnecessarily large batch of epoxy putty, got it nice and wet, and carefully daubed it into the seams. While the putty dried, I also tweaked one of the tusks into better alignment. In other words, I knocked his teeth loose and then glued them back into place. The putty contracted as it dried, so while the gaps were sealed, evidence of them remained. I began to work on this problem with my first coat of gray primer. I applied the paint more liberally where unwanted gullies and rough spots remained. By the time I finished the black under coat, these were significantly muted. The model was starting to blend together. 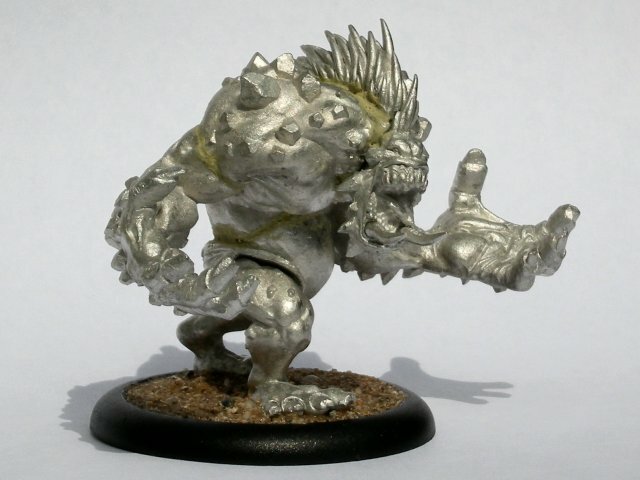 Let’s compare my version to the brilliant Privateer Press studio model.